Chef Bruce Ricketts and The Moment Group prove once more through this casual Japanese fusion restaurant, that theirs is a winning formula. When word spread that the culinary genius, chef Bruce Ricketts, behind the tried-and tested Sensei Sushi (in BF Homes Paranaque) and the stellar Mecha Uma (his brainchild with The Moment Group in BGC) was opening yet another Japanese venture in Rockwell called Ooma, lines for days on end were to be expected. And of course when this writer went, lines and waitlists there were. Restaurateur extraordinaire, Abba Napa, of the dynamic and ever-growing Moment Group co-created this Japanese fusion gem together with Ricketts. You’ll find little or no traditional fare here and in its conventional stead, you’ll find Ricketts wielding free rein on playful mergers of bold flavours while Napa has brilliantly put Ooma’s best foot forward in a dovetail of culinary cues. 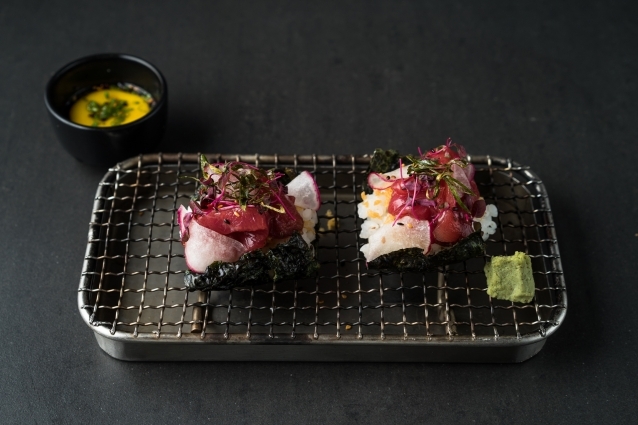 A must-try signature dish is the Maguro Zuke Taco Maki, a soy and olive oil-marinated piece of tuna, sandwiched in an open-faced temaki wrap accompanied by an egg yolk dipping sauce. 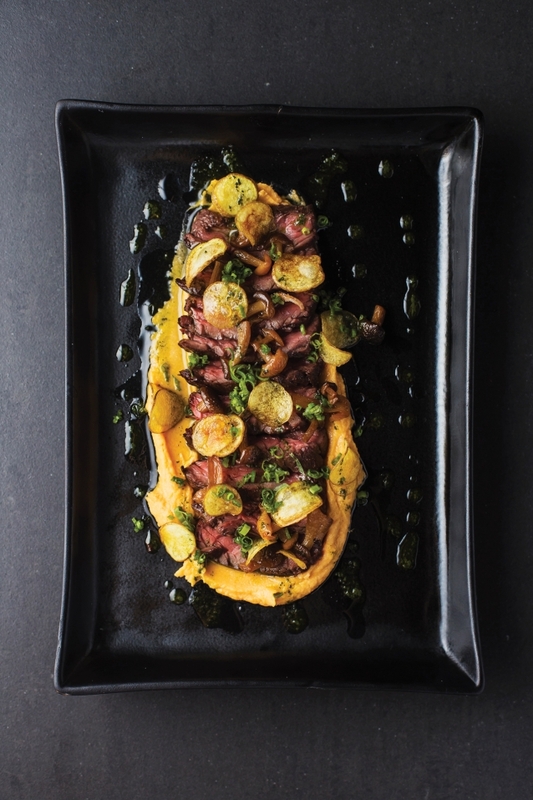 An extraordinary experience is the hanger steak: tender strips laid seductively over a creamy sweet potato mash, and drizzled with white truffle oil, ponzu butter and a hint of herb aioli. Adding to the dreamy mélange of textures are the sautéed mushrooms and the smattering of baby potatoes fried to a crisp. Healthier palates will certainly appreciate the fresh Tataki dishes, particularly the salmon and tuna. 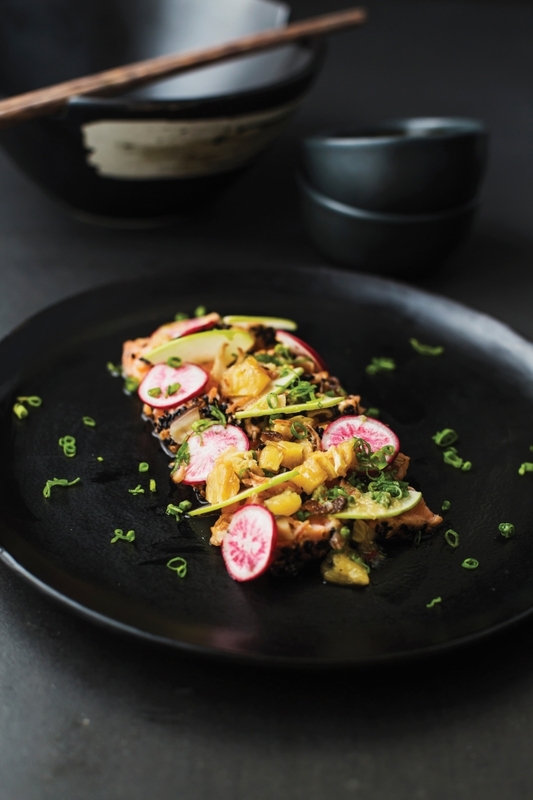 Both sesame-crusted and armed with pickled red radish and a ginger garlic sauce, the salmon finds fine company in the sweet roasted pineapple, while the tuna marries well with the pickled mushrooms and fried shallots. The Salmon Belly Maki, on the other hand, is a fattier yet brilliantly carb-free version and yet is absolutely soul satisfying in every way. 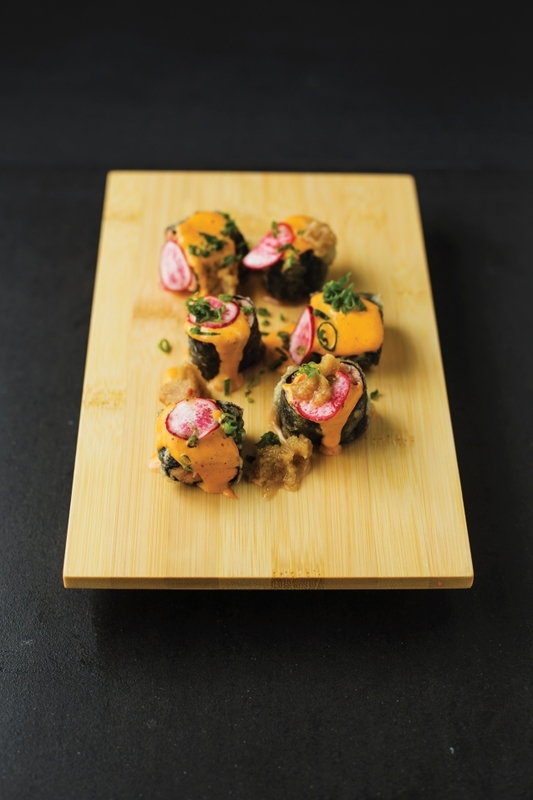 There also exists on the menu a broad range of blow-torched delights: the oyster Aburi Maki, for one, which spectacularly combines a crunch and creamy cheesiness. 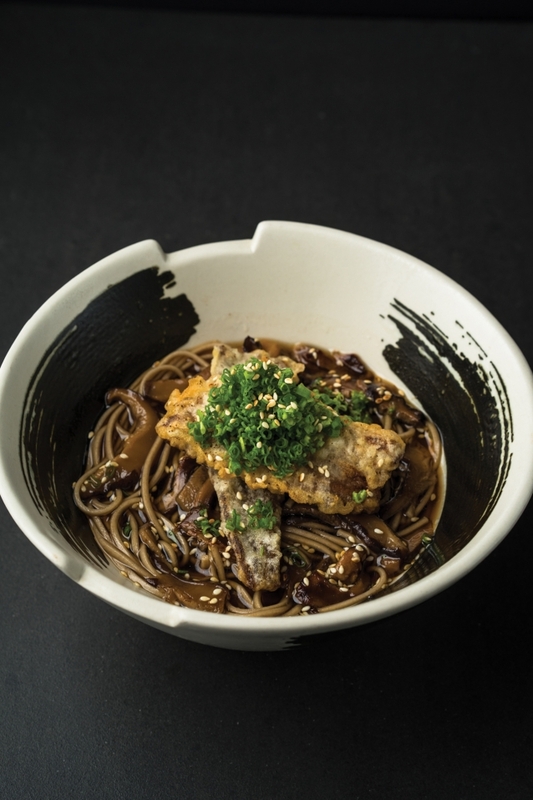 Then there’s the element of comfort food – an Anago Truffle and Mushroom Soba, featuring fresh water eel tempura atop buckwheat noodles in a steaming hot broth. And what better way to enjoy the unique twist on Japanese fare than with good ‘ol sake? Thanks to Napa and her Moment Group co-founders, Eliza Antonino and Jon Syjuco’s predilection for such, the bar on the second floor features a wide variety, both in its unadulterated form as well as refreshing cocktails.